We specialize in offering an assorted range of Drip Irrigation Accessories in the national as well as international market. 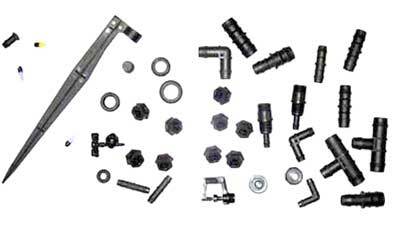 The Drip Irrigation Fitting Accessories manufactured by us are used as replacement parts. These drip irrigation accessories are made from high quality raw materials accessible in the market. They are easy to install and have low maintenance cost. The accessories are resistant to wear and tear as well as corrosion. Apart from that, we are one of the eminent Drip Irrigation Spare Accessories Suppliers in India.